For more information regarding this event, please email Py-Psychology_50thAnniversary@soton.ac.uk . This year we are celebrating 50 years of Psychology at the University of Southampton and would love for you to come and celebrate with us. Our golden anniversary reunion event will take place on Saturday 11th July 2015 from 11am to 5pm in the Turner Sims building, Highfield Campus. This free event, for past and present students, staff and their families, will be an opportunity for the department to celebrate our achievements over the past 50 years. Our reunion celebrations will start with registration at 11am. 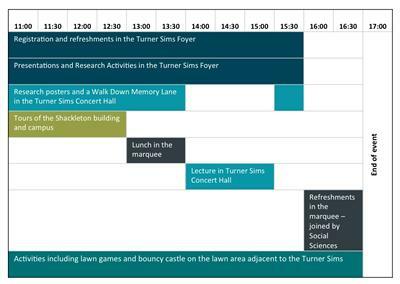 Throughout the day, there will be a whole host of activities on offer, including:presentations and hands-on activities relating to current research being conducted at the university, laboratory tours and research demonstrations in the Shackleton building (the hub of Psychology since 1996), campus tours, a complimentary buffet lunch, a lecture looking back at the past 50 years and series of mini-lectures by current staff members. You will have the opportunity to mingle with current and past staff and students, to share memories of your time as a student at the University and to reconnect with old friends. There will also be displays showing the history of Psychology as well as some of the exciting research and teaching innovations in which we are currently involved. From 4pm onwards, there will also be an opportunity to reminisce with alumni from Social Sciences who are also celebrating their 50th Anniversary. If you are in touch with other Psychology alumni please encourage them to register too. 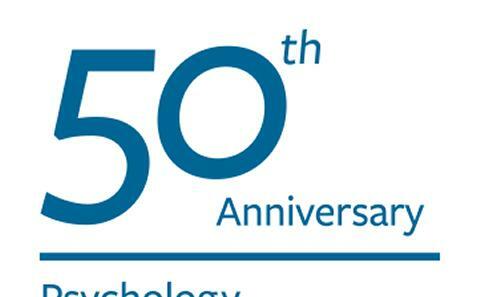 If you need any further information please do not hesitate to contact us on Py-Psychology_50thAnniversary@soton.ac.uk. You can also mail pictures to Gwen Gordon, Senior Faculty Administrative Officer, Faculty of Social, Human and Mathematical Sciences, University of Southampton, Highfield Campus, Southampton, S017 1BJ. We hope you can join us in July for this very special occasion.